Although they practice Buddhism, the Helambu Sherpa live in the only official Hindu state in the world: Nepal. 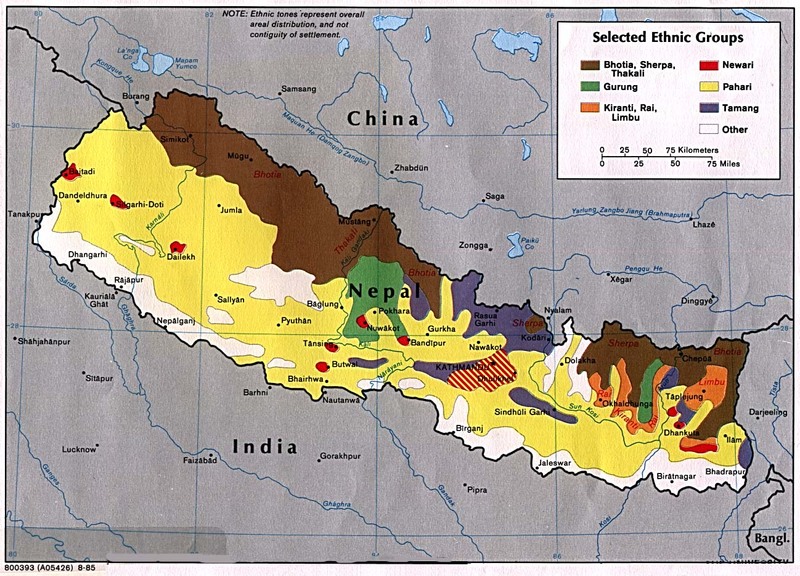 This small nation is landlocked between India and Tibet, and the Helambu Sherpa live in the south central portion of the country. The Helambu Sherpa migrated from Tibet to Nepal in the 15th century in order to flee religious persecution. At that time, a Mongol King attempted to force them to convert to his sect of Buddhism. The people fled to the Khumbu region, and later moved further into the Helambu region. The language of the Helambu Sherpa is very similar to Tibetan, and they can still communicate in a simple form of Tibetan. They are distinguishable from Tibetans in part because their faces are smaller and they wear a colorful apron on their backside rather than the front. The name Sherpa means "people from the East." They received this name from landlords whom they served. Tourism has grown in importance in Nepal since the 1960s. Kathmandu, the capital city, attracts visitors because of its many picturesque temples. Such temples are characteristic of Buddhist art and architecture. A growing number of hikers and mountain climbers are using Kathmandu as a major base for expeditions to Mount Everest, and for hiking tours in the Himalayas. This has provided the Helambu Sherpa with their main source of income. Every house along the trail has become a lodge crowded with weary trekkers each day as evening approaches. The women serve as shopkeepers, cooks, and hostesses. The men also cook, clean, and keep the visitors happy. Apart from serving the tourists, the Helambu Sherpa are farmers. They grow primarily potatoes and corn, and buy their rice from the valley areas. Their staple food consists of jhamba (porridge). Their main drink, raksi, is a local brandy made from wheat. Most Helambu Sherpa live in two-story homes built with stones, concrete blocks, and wood. Their villages are on the lush foothills of the Himalayan mountains. However, because of the tourism industry, Western culture has influenced many of the Helambu Sherpa villages. Along with the colorful aprons, the women wear wrapped dresses called bhokkus, which are ankle-length. The men wear bhokkus that come only to their knees with suruwals (tight-fitting, warm trousers) underneath. The men also like to wear thick sheep-skin jackets. Most of the Helambu Sherpa are Buddhists. Every home has a decorated corner set aside for their gods. High places are often areas of worship. There, flags with prayers written on them are hung in hopes that some god may hear their pleas. Colorful festivals are abundant, each one devoted to obtaining favor with a different god. The mild face of the Buddha occupies every Helambu Sherpa altar. One festival, Gyawa, takes place 49 days after the death of a loved-one. The people gather to eat as much as possible during the festival, believing the food will go toward nourishing the loved one who has died. The Helambu Sherpa are easy going and relaxed. Most eat well and usually have reasonably clean water from the mountains. Despite the outward peace, however, there are signs that their culture is unraveling. Alcohol and greed seem to permeate the social fabric. 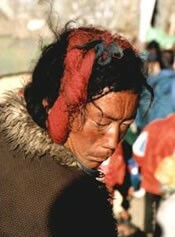 A large number of Helambu Sherpa live in Kathmandu for part of the year, which makes them available to hear the Gospel. However, though many have an awareness of Christianity, there are only a handful of known believers among them. These few stand alone as Gospel witnesses to their people. The Helambu Sherpa of Nepal have little or no opportunity to know Jesus Christ as their Lord. * Ask the Lord to call people who are willing to go to Nepal and share Christ with the Helambu Sherpa. * Ask God to strengthen, encourage, and protect the few Helambu Sherpa Christians. * Ask the Lord to remember His blood sacrifice for the Helambu Sherpa, and to draw them to Himself with loving-kindness. * Ask the Holy Spirit to prepare the hearts of the Helambu Sherpa to receive the Gospel and soften their hearts toward Christians. * Ask the Lord to raise up a strong local church among the Helambu Sherpa.View Sherpa Helambu in all countries. Location in Country: Approximately 15,000 Helambu Sherpa people live in the Nuwakot and Sindhupalchok districts of the Bagmati Zone in central Nepal. A sizable community of Helambu Sherpa also lives in the nation's capital, Kathmandu.